This post is a bit different from the rest. The topic is about Aliens and UFOs. Extraterrestrial Aliens. The featured video is in my opinion one of the best and objective UFO documentaries around, Out of the Blue. If there's one UFO documentary to watch, this is it. I highly recommend it. The full video is posted below. And talk about conspiracies, hehe.. since I posted this for some reason a majority of the readers were given the link for mobile phones making the screen small. Click HERE to go to the full web version. How relevant is it? Well, in 2004, in an Advocacy Initiative effort led by the Sci-Fi Channel and President Clinton's Chief of Staff, John Podesta, copies of Out of the Blue were given to 435 members of Congress with the hope that it might lead to the disclosure of what the U.S. Government actually knows about UFOs. The film is narrated by Peter Coyote and attempts to show, through interviews with members of the scientific community, eye witnesses and high-ranking military and government personnel, that some unidentified flying objects could be of extraterrestrial origin and that secrecy and ridicule are used to shroud the UFO issue. 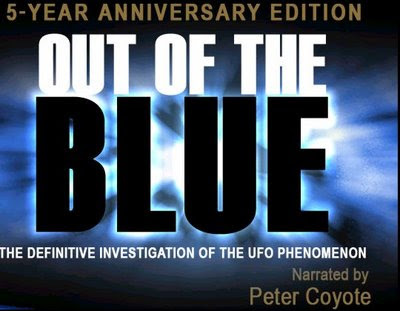 OUT OF THE BLUE is widely considered one of the best documentary films ever made about UFOs and was directed by celebrated filmmaker James Fox. The films producers traveled around the world to investigate some of the most famous UFO events on record. Through exclusive interviews with high-ranking military and government personnel, this award-winning film supports the theory that some UFOs are of extraterrestrial origin.